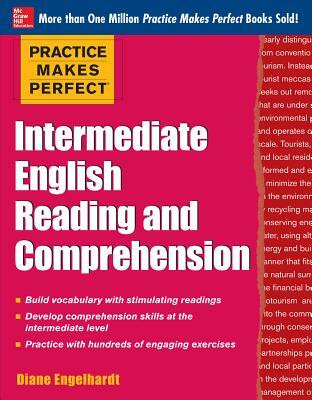 Reading English texts that are created especially for ESL students like you is a critical part to learning the language, but that does not mean you have to be bored with the subjects Created by expert ESL instructor Diane Engelhardt, "Practice Makes Perfect: Intermediate English Reading and Comprehension" features 15 engaging readings on interesting topics such as the technology of 21stcentury deep-sea treasure hunting, Pixar Studios' computer-generated movie magic, the Flying Doctors of Australia, and more. You will, of course, get plenty of practice, practice, practice on understanding and comprehending vocabulary. You'll master how to read for main ideas, summarize texts, make outlines, remember facts and figures, and more. Before you know it, your reading skills will be stronger and your comprehension will grow, enabling you to get more out of English-language texts. Description: 224 Take your skills to the next level and get more meaning out of the English language. Reading English texts that are created especially for ESL students like you is a critical part to learning the language, but that does not mean you have to be bored with the subjects! Created by expert ESL instructor Diane Engelhardt, Practice Makes Perfect: Intermediate English Reading and Comprehension features 15 engaging readings on interesting topics such as the technology of 21stcentury deep-sea treasure hunting, Pixar Studios' computer-generated movie magic, the Flying Doctors of Australia, and more. You will, of course, get plenty of practice, practice, practice on understanding and comprehending vocabulary. You'll master how to read for main ideas, summarize texts, make outlines, remember facts and figures, and more. Before you know it, your reading skills will be stronger and your comprehension will grow, enabling you to get more out of English-language texts.